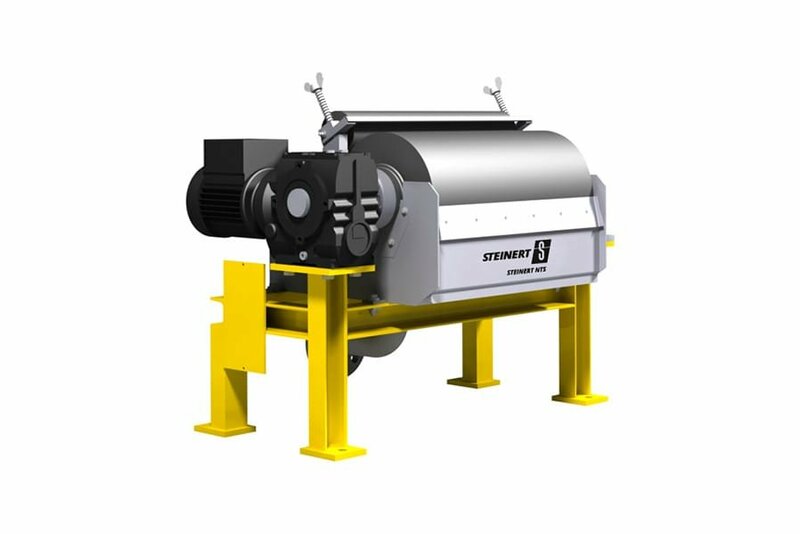 We have specifically developed the STEINERT NTS wet drum magnetic separator for the finest grains < 10 µm. It is mostly used in combination with our STEINERT HGF high gradient magnetic filter to further process the matrix separator's rinsing concentrate to a highly enriched sludge. At lower throughputs, the wet drum magnetic separator can also be used directly for process water from degreasing baths and other liquids. Its particularly powerful neodymium magnet system ensures reliable capture of magnetic particles. The liquid flows through a semi-circular separation space beneath a stainless steel drum to which the magnetic particles are attracted. Permanently magnetic discs arranged radially within the drum ensure close magnetic field transitions and thus the production of high field gradients on the peripheral surface of the cylinder. The high quality of the permanent magnets we use has a direct influence on the separation results. The rotating drum feeds the attracted iron particles upwards out of the solution. A rubber roller is first used for draining before the separated iron at the top of the drum is scraped off the drum surface by an adjacent separating splitter. The separated product is then available as a highly concentrated iron sludge with high solids contents. I agree to Steinert GmbH collecting and processing my personal data (name and e-mail address) for the purposes of advertising and product improvement. I further agree to Steinert GmbH contacting me by e-mail with personally tailored information, offers and promotions concerning Steinert products and services. I may revoke this consent at any time with effect for the future.